Not all the things I crochet are a success. In fact most of the things I make are dismal flops like the hat I just made which looks more like a Marge Simpson hairdo than a slouch beanie. I won’t be going anywhere in this. 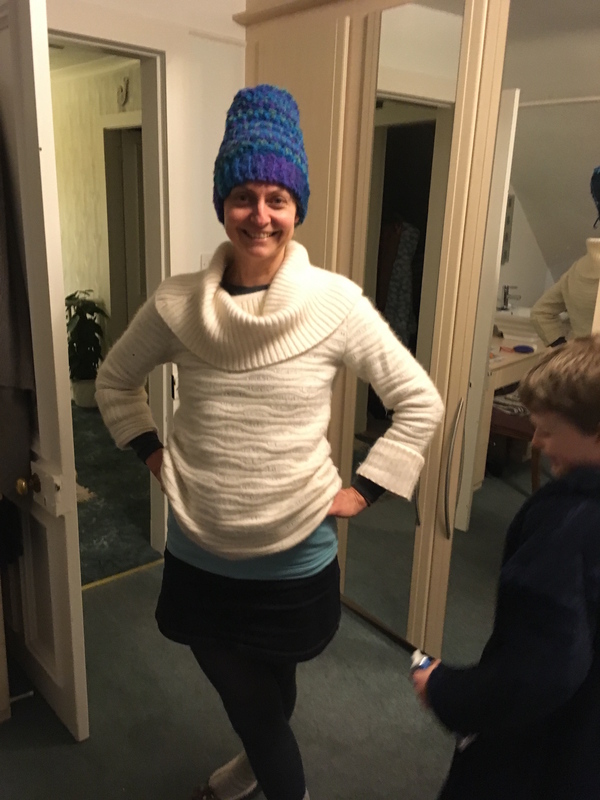 Posted in Crochet, Journal and tagged crochet, failure, Marge Simpson, slouch beanie. Bookmark the permalink. I still like it! Could you fold up the ribbing at the bottom? Maybe but I think the main problem is the hook is too small for the yarn or the yarn is too thick. It shouldn’t be able to stand upright like that. Oh yes, that’s even worse. I’m amazed that a knitted object can do that, as wool is usually floppy. You must have been so surprised when it turned out like that. It seems to have given Daniel a good laugh, although maybe it’s actually an expression of horror? Crochet can create fabrics that are much less flexible although I could have made this less rigid by choosing a larger hook or different yarn. It’s a bit of a disaster! You live and you learn – I never knew those things! You could turn it into a drawstring bag just by running a couple of handles around the mouth. I hate when things don’t turn out the way I pictured, but then again, we have to make mistakes in order to learn. Oh that’s a great idea! It’s just the right size for that too. Thanks for the suggestion.